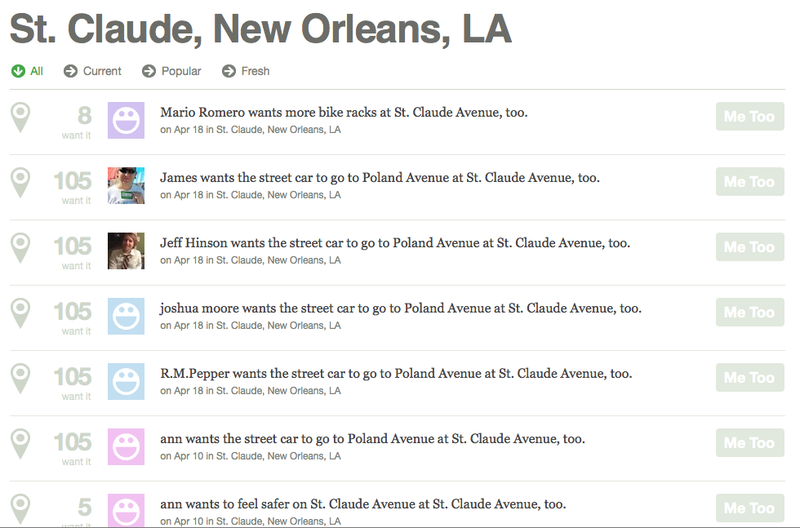 Its nice to see a New Orleans startup raise funding. The last time we recall hearing of such an event it was an April Fools hoax. New Orleans-based Neighborland has raised funding from The Obvious Corporation, True Ventures, Lerer Ventures, SV Angel, Crunchfund, and Voodoo Ventures. We like the concept here as we have been surprised at how off-line the neighborhood discussions can be. Neighborhoodland gives people in cities and their hoods an easy way to sound-off on what the want to see new and what they don’t like. It could just be a whiner’s fest, but the vote-up set-up allows popular ideas to grow. Is there value to that? We say yes. Especially in the neighborhood setting, if we see an idea floated by a neighbor, we might seek that person out during a walk to discuss the idea further. At some point, the local government operatives might jump into respond. The startup was founded by Dan Parham, Tee Parham, and Candy Chang who mostly have UX backgrounds.